Simon Says Stamp has released stamps and dies designed by Cathy Zielske to celebrate STAMPtember! Special thanks to Cathy for collaborating on this exciting celebration! This is not a limited edition STAMPtember release. That means, once it sells out, we will be restocking. Yay! My card today features the newest CZ Design Coolest Yulest Stamp Set. I created both a background (splattered with paint) and stamped elements with a pigment based ink that I added clear embossing over to make them shiny and to seal in the color. While clean and simple in design, small details make all the difference! The trees from the CZ Design Coolest Yulest Stamp Set were stamped on an A2 sized piece of smooth white cardstock using Simon Says Stamp Evergreen and Beanstalk Green Inks. Watered down Peeled Paint and Tarnished Brass Distress Paints were flicked over the background with a small paintbrush. While the background paint was drying I die cut a rectangle using a Simon Says Stamp Stitched Rectangle Die. The reindeer and word "merry" from the CZ Design Coolest Yulest Stamp Set were stamped with Vintage Photo and Fired Brick Distress Oxide Inks and heat embossed with clear embossing powder. Because the Distress Oxides have pigment ink in them, they are perfect for embossing! 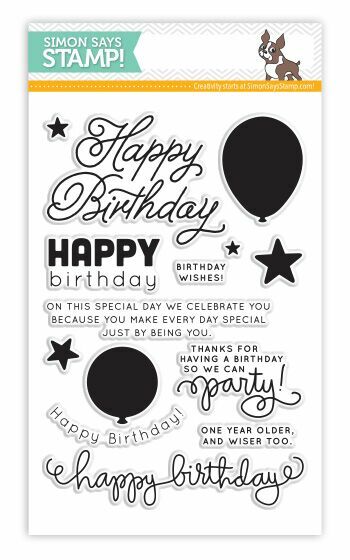 Additional greetings from the CZ Design Coolest Yulest Stamp Set were stamped on black cardstock using Versamark Ink and heat embossed with white embossing powder. The phrases were trimmed into thin strips and adhered around the word "merry" as shown. The panel was adhered to the tree background with foam adhesive. The panel was adhered to the tree background with foam adhesive and a drop of Nuvo Crystal Drops in Autumn Red was applied to the tip of the reindeer's nose.